Holiday Rentals & Bed & Breakfast Lurbe St Christau, Les Vallees B&b, Ancien Hotel Des Vallees, Lurbe St Christau. At the foot of the mountains, the valleys of the former Hotel opens the door to a unique landscape where relaxation and discovery await you. Located in the heart of the Vallée d'Aspe Lurbe Saint Christau and 650m altitude, nature lovers will not be spoiled for choice! 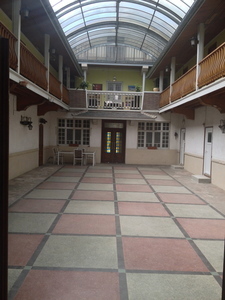 Amazing Basque style 30 bedroom hotel, now turned into Guest house, with Bar & Restaurant on ground floor, offers guests the ultimate in B&B value. Each room has its own shower/bathroom/toilet, with magnificent views of the Valleys & Pyrenees mountains. Its absolutely ideal for groups who wish low-cost accommodation, yet with the amenities & advantage of a hotel: Suprette (convenience store), bar, restaurant are all on the ground floor. With a volume of 2000 m2, and a park in exceed of 1 hectare, the des Vallees Guest House, Lurbe, really gives you, or your group, the privacy, space and comfort to enjoy your stay in the region. Once you book, we even pick you up from Oloron Station and drive you back. Take out our complementary bikes, and cycle from village to village to really enjoy and take in the splendour of the Valley. Built in the early 19th century, with the Basque style & spirit proudly sown into every wall, this famous former hotel, splendid & ever-luminous, has still retained its charm & character throughout the years, becoming a proud witness and icon of its era. Given its famous history, the name “Hotel des Vallées” is still its official address. You will easily be seduced by its famous large patio, inviting you to relax in the summer sun, perhaps with an ice-crushed fresh lemon juice, prepared for you in our bar. *By a simple phone call, we can pick you, or your group, from Oloron Ste-Marie Station, and return you back when you wish. *Use the complementary terrain bicycles offered by The Villa Hotel des Vallées to fully experience the beauty of the surrounding villages, beautifully nested within the magnificent backdrop of the Valley and its glorious mountains. Despite being converted into a Villa of grand stature, L’Hotel des Vallées still maintains the charm and character it was famed for where it was the venue of choice for weddings & local feasts from Pau to the outskirts of the Basque & Bearn regions. This indeed makes staying at our Villa an exceptional advantage as you benefit from the former Hotel’s immense volume and living quarters, its facilities (including Restaurant & Bar) providing you, and your group, a particularly private, comfortable & convenient stay. Given this was a former Grand hotel, the interaction with guests is very discrete. We are there to serve a sumptuous breakfast in the morning and supper in the evening. If you are coming by Car, the best way is to come via Oloron Ste Marie, and then follow signs to Lurbe (we are just 5 minutes away). If you are coming by train (SNCF) - take the train to Oloron Ste Marie, and then a bus number 63 will take you from Oloron Station directly to Asasp - we are a short walk from Asasp. Alternatively, just book, call us, and we'll pick you up, FREE of charge.